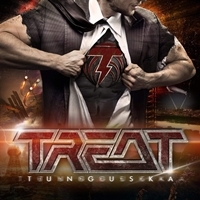 The return of the Swedish band TREAT really consolidated in 2018. The albums "Coup De Grace" (2010) and "Ghost Of Graceland" (2016) released after the reunion of the band in 2006, solidified in a masterful album we come across this year with musicians at their best, firing the "Tunguska" album among many live accolades and performances that have yielded an excellent critique that has grown since the previous two albums. Being praised as true masterpieces, TREAT released their new album in a an energetic melodic line that represents much of the new trend of current bands and fit perfectly to the profile of these musicians that counteract the wear and tear of time and reflect a constant for lyrics and captivating melodies, an excellent production that has already become an identity of the albums released by Frontiers Records and a fan base with the results of this new album. The title of the album after a reference to a mysterious big explosion that occurred in Siberia in 1908, but also represents the last piece of the puzzle to be placed since the reunion of the band, as comments guitarist, producer and founding member Anders Wikstrom. Highlighting the unique musicality that these musicians have developed together over the years in the creative process of composition, a deepening of the production and the result of this work already beats the ears of many fans as one of the best releases of 2018. "Tunguska" is another album produced by respected producer Peter Mansson, along with Anders Wikström, and this is a perfect combination because as a long time fan of the band, Peter keeps the best aspects of these musicians in the game. The result brings the excellent single "Build The Love"or lines that take the listener's attention as "Progenitors","Always Have, Always Will" and "Rose Of Jericho". "Progenitors" opens the album as a futuristic sound vision that leaps into impact choruses and I still have the lyrics in my mind after a few auditions. The chorus vocals favor the atmosphere and I'm really surprised at the performance after 35 years of existence of this band that still brings me great memories of the times of "Organized Crime" of 1989. "Best Of Enemies" is another band full of energy and I recognize that these musicians should remain proud, the guitars still keep scintillating on a firm basis on the drums and bass of Jamie and Pontus. "Build The Love" is a favorite on this album. The energy here becomes magnificent and I can hear the fans singing at the shows. Plus we get a great track for "Tomorrow Never Comes". I understand that many bands are tirelessly trying to make a decent return, but these albums do not always turn out to be something that is able to match new and demanding bands. But when we talk about TREAT, be sure, these guys have found the musical youth and I'm certainly looking forward to an upcoming show.